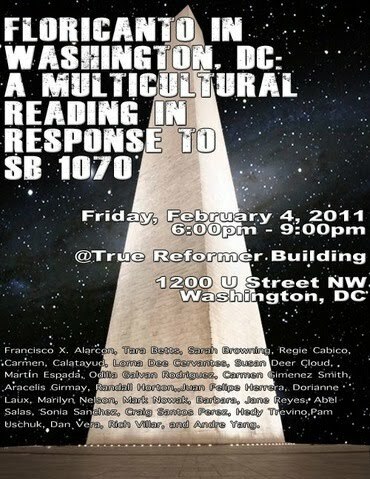 Friday, February 4th, 6:00 pm, The True Reformer Building, 1200 U Street, NW. $5 suggested donation. None turned away. 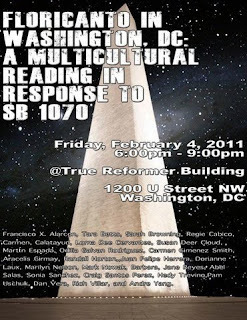 Join us as more than 20 poets lend their energy and language to a group reading in response to Arizona Senate Bill 1070 and in resistance to the atmosphere of national xenophobia under which the bill (and its emerging counterparts) were created. Confirmed readers include: Francisco X. Alarcon, Tara Betts, Sarah Browning, Regie Cabico, Carmen Calatayud, Lorna Dee Cervantes, Susan Deer Cloud, Martín Espada, Odilia Galvan Rodriguez, Carmen Gimenez Smith, Aracelis Girmay, Randall Horton, Juan Felipe Herrera, Dorianne Laux, Marilyn Nelson, Mark Nowak, Barbara Jane Reyes, Joseph Ross, Abel Salas, Sonia Sanchez, Craig Santos Perez, Hedy Trevino, Pam Uschuk, Dan Vera, Rich Villar, and Andre Yang. Please join us in standing for unity and solidarity. For an easy commute take the Circulator Bus to the corner of U & 14th only $1! 2011 Poetry Contest: Winners Announced!